Visitors approaching Gullfoss, whose name translates as "Golden Falls" in English, might think it empties into an abyss given its unusual drop. The glacier-fed falls, about 70 miles east of Reykjavik, plunge abruptly into a wide and narrow canyon at a perpendicular angle, creating a striking scene. The two-tiered waterfall drops about 105 feet into the Hvita River in south Iceland. 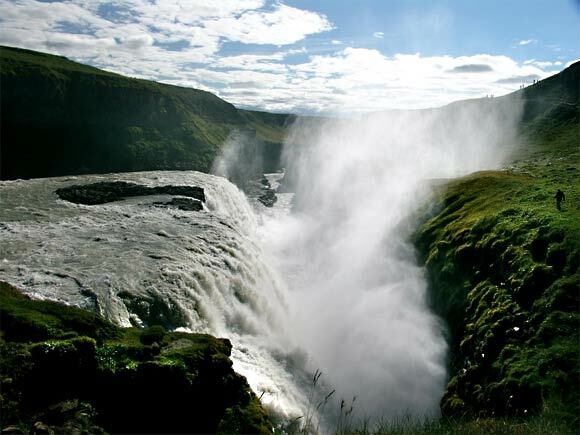 On average, water flows through Gullfoss at a rate of about 29,000 gallons per second. Heavy flooding has produced as much as 530,000 gallons per second. For comparison, American and Bridal Veil Falls at Niagara Falls flow at an average rate of about 76,000 gallons per second. Gullfoss is now one of Iceland's most popular attractions, but in the early 1900s, industrialists sought to harness its cascades for hydroelectric power. A struggle for the falls ensued, but plans eventually fell apart. 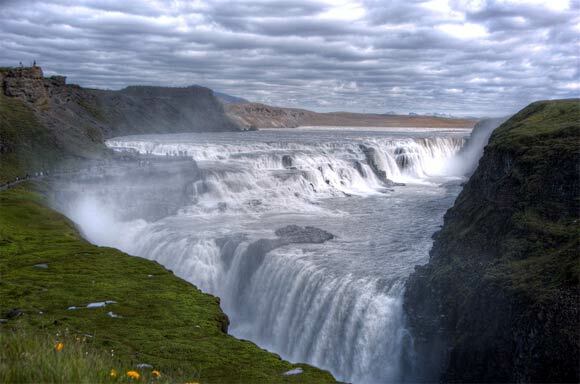 In the 1970s, Einar Gudmundsson donated the grounds surrounding Gullfoss to the Icelandic Nature Conservation Council, and it was later turned into a nature reserve. Gullfoss lies on Iceland's Golden Circle, a 190-mile stretch of road encompassing some of the country's most popular natural attractions. Other destinations along the route include Geysir, a geyser that spits out water up to 200 feet in the war, and Thingvellir, a scenic national park where Iceland's leaders gathered during the Middle Ages. 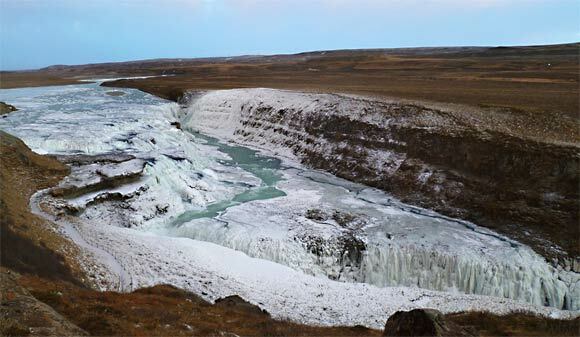 In the winter, parts of Gullfoss freeze to create an icy wonderland.